CEVA offers the smallest and lowest power Wi-Fi IP platforms, called RivieraWaves Surf, encompassing 802.11ac 1x1 and 2x2 MAC and Modem cores and platform. They are provided with LMAC (aka thinMAC, for use with linux/Android mac80211 UMAC) and LMAC+UMAC (aka FullMAC) software protocol stacks. 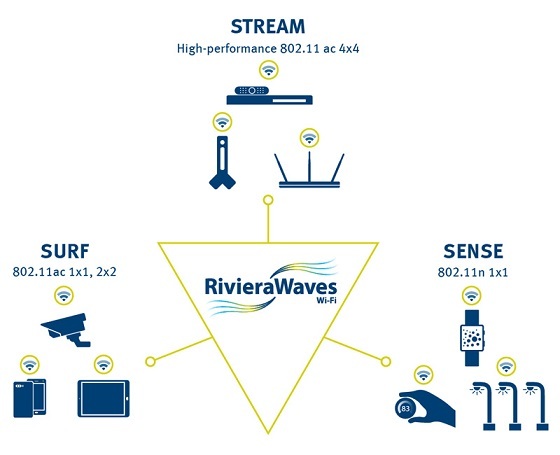 The RivieraWaves Wi-Fi Surf platforms can be used in a standalone single chip or integrated into a bigger System on Chip (SoC) such as application processor or baseband processor. The RivieraWaves Wi-Fi Surf platform is ideal for power sensitive applications such as smart phones, tablets, portable game console or digital cameras, but also digital TV, Set Top Box, Over The Top, and mobile access points. CPU agnostic, the RivieraWaves Wi-Fi Surf software protocol stacks can be executed on any CPU controller such as ARM, Cortus or others. It is also possible to use the CEVA TeakLite 4, with the additional benefit of executing in parallel audio processing or other always on sensor hub. Silicon independent, the RivieraWaves Wi-Fi Sense platform support several radio IPs from various partners such as Catena and Maxscend. Other RF can be easily supported on customer demand. The RW-WLAN-11nac MAC core implements the 802.11a/b/g/n/ac standard with throughput of up to 433Mbit/s for 1x1, and 867Mbit/s for MIMO 2x2 with 2 spatial streams. It also supports the 802.11e standard (QoS) and the 802.11i standard (Security) extensions. RivieraWaves profound expertise in wireless communications resulted in the highly optimized MAC core with special focus on low memory and MIPS requirements while maintaining a small gate count. The MAC core interfaces to the ARM standard AMBA bus.